In January 2014 I started work at the financial and corporate PR agency, Hudson Sandler, as head of digital. One of the projects I worked on there was revamping the agency’s website, which was sorely out of date and failing to generate any inbound sales enquiries because it was not appearing in search engine results for any relevant terms. I started work on this project in autumn of 2014 and by the time I left the agency in summer 2015, the website was on the front page of Google for many relevant search terms, and right at the top of the results for key terms such as ‘financial PR agency’ and ‘corporate PR agency’. During that period the monthly traffic increased exponentially and the site began generating lucrative sales leads for the agency. My budget for this project was £0, and there are dozens of much larger UK agencies competing for those search terms. The first step was to move the site from static HTML pages to a content management system that would make it easy for us to add and edit content, so we migrated the old site to WordPress with a modified off-the-peg template to match the agency’s branding. I also installed an SEO plugin which automatically generated sitemaps and allowed me to manually edit page titles and meta-descriptions. Next I overhauled the site’s static content. PR agencies tend to favour fluffy, strategic sounding language which is absolutely no use for SEO purposes – search engine algorithms aren’t good at deciphering marketing doublespeak. So I rewrote as much of the content as possible with clear, descriptive copy about the agency and the services it offered. I also made sure that the site had plenty of internal links with descriptive anchor text. In addition to the static content I introduced a blog to the site so we could regularly post updates about the agency and thought leadership pieces, this was central to the whole approach. Over several months we wrote a lot of blog posts that were tightly focused on our key subject areas of financial and corporate PR. This doesn’t mean churning out copy stuffed with keywords, but simply that the articles were all specifically about different aspects of the topic at hand. I also made a point of writing lengthy blog posts of around 1,000 words or more where possible, because most SEO experts believe that longer articles are better than 400/500 word blogspam. Writing a lot of good quality, on-topic, long-form blog posts is hard work, but there are no shortcuts here, your site’s search engine rankings depend on great content, so you need to put the effort in. The results we achieved prove the value of that. Having fixed the site’s structure and greatly improved the quality of content, there was one final piece of the puzzle to solve; backlinks. Your site’s SEO is highly dependent on both the number and quality of links pointing to it from third party sites. In short, you need as many links as possible from high authority sites (i.e. websites belonging to established media, big corporations, government, academia and other respected sources) and this is very hard to achieve. This is where we relied on good old fashioned PR skills to charm and persuade people to link to our site. We asked clients to link to us from their online press centres, we created stories which gave the trade media good reasons to write about us, and we came up with a few other creative ways of getting links from authoritative third party sites. As with the content, there are no shortcuts here any more; if you want good quality links to your site, doing the legwork is the only way to make it happen. And that’s pretty much the long and short of it. Using Google Search Console we were able to track how our site was appearing in search results and we noticed an almost immediate improvement, but it took a couple of months before we started to see our site at the top of the results for relevant search terms. Over time, as we added more content and secured more links, the results got better and we began to inch out major competitors for our most important search terms. If you take away anything from this story it should be this – everything I did was relatively simple. Sure, it’s hard work to create a pipeline of good content and to get lots of quality backlinks but there’s no dark art to any of it, you just have to put the hours in. I’ve been in PR for nearly ten years and was lucky enough to join the industry just as it started to become entangled with digital and social media, which enabled me to carve out a little niche for myself as a digital specialist since I happen to have a bit of experience in the online world. Before PR I was a tech journalist for 13 years and, to be honest, it still sometimes feels strange not turning up to an editorial office every day. When people ask me why I made the leap, I usually tell them that it seemed like the most logical progression, but the truth is that PR is a very different world to the kind of tech-magazine journalism I spent much of my life doing. I don’t feel like I made any sort of logical, smooth progression, I feel like I jumped right into the deep end of a completely new career. The most noticeable change in your day to day life is that people stop treating you like you’re important, but I think all but the most deluded of journos would expect that, so it’s not worth dwelling on. There are other changes that I was less prepared for. When I was a hack I lived in a little bubble that was protected from any kind of commercial reality, all I had to worry about was producing great articles and meeting deadlines (or at least, not missing them by too much). Most of the tech magazines I worked on had an atmosphere that was somewhere between a playground and a laboratory – lots of smart people in a room together, having fun and challenging each other. The suits always took care of the business side of things for us. In a PR agency, you’re acutely aware from day one that you need to earn your keep: all that really matters is getting good results for the client and winning new business for the agency. This may seem perfectly obvious, but it can be a serious culture shock for somebody who’s only ever been judged on something as subjective as how well they can write. When I was a journalist I was largely free to manage my own time as I pleased, so long as I showed up to the office occasionally and the work got done on time. PR agencies require their staff to fill in timesheets to account for every minute of their day because their staff’s time is, essentially, their chief commodity and they need to keep track of it closely. 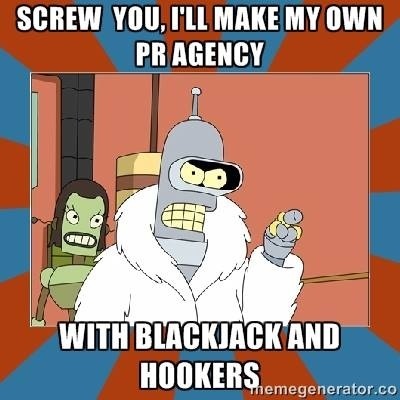 In all honesty, this is the one part of the PR industry I have always struggled to adjust to. I completely understand the need for it, I just hate having to do it. Journos going into PR at a junior level are probably better equipped for the move, because they are most likely to be focusing on getting coverage and if they’ve got good contacts in their industry they’ll probably do quite well. At the more senior levels, it’s a different game entirely. Firstly, you have to deal with clients, who can sometimes be difficult and demanding – they’ve invested significant budget in your agency, and they’re depending on you to do a good job, so they’re understandably going to want to make sure you’re doing your best to deliver on your promises, so that they can deliver on the promises they’ve made to their boss. Secondly, you need to learn a lot more about budgeting and project management. Putting a magazine together has its own challenges, but running PR activities for major corporations requires a completely new skill set. Finally, you have to learn to pitch and win new business – it’s a steep learning curve, and often requires the same kind of all-hands-to-the-pump attitude that magazines go through on deadline week. It’s good fun though, and the buzz you get from working on a winning pitch is one of my favourite things about the job. One of the most interesting differences between journalism and PR is the attitude to creativity. All PR agencies strive for creativity, they hold brainstorms and run training sessions and hire consultants to help their teams be more creative, while on all of the magazines I’ve worked for, creativity just happens by itself. I think the reasons for this are pretty much everything I’ve outlined above – it’s easier to be creative when there’s a distinct lack of pressure in your working environment. Obviously, PR agencies need that pressure, they need to get results for clients, win new business, track their staff’s time and all the rest of it, but ultimately that makes it so much harder for people to be as creative as they could be in a more relaxed atmosphere.